The original Sony Walkman, the first personal stereo tape deck, which made its debut in 1979. Attention, the 160 million or so owners of an Apple iPod MP3 player: take out those white earbuds and listen for a second. Before the iPod became ubiquitous  way, way before  there was the Walkman. The portable cassette players, first introduced 30 years ago this week, sold a cumulative 200 million units, rocked the recording industry and fundamentally changed how people experienced music. Sound familiar? The Walkman wasn't a giant leap forward in engineering: magnetic cassette technology had been around since 1963, when the Netherlands-based electronics firm Philips first created it for use by secretaries and journalists. Sony, who by that point had become experts in bringing well-designed, miniaturized electronics to market (they debuted their first transistor radio in 1955), made a series of moderately successful portable cassette recorders. But the introduction of pre-recorded music tapes in the late 1960s opened a whole new market. People still chose to listen to vinyl records over cassettes at home, but the compact size of tapes made them more conducive to car stereos and mobility than vinyl or 8-tracks. On July 1, 1979, Sony Corp. introduced the Sony Walkman TPS-L2, a 14 ounce, blue-and-silver, portable cassette player with chunky buttons, headphones and a leather case. It even had a second earphone jack so that two people could listen in at once. Masaru Ibuka, Sony's co-founder, traveled often for business and would find himself lugging Sony's bulky TC-D5 cassette recorder around to listen to music. He asked Norio Ohga, then Executive Deputy President, to design a playback-only stereo version, optimized for use with headphones. Ibuka brought the result  a compact, high-quality music player  to Chairman Akio Morita and reportedly said, "Try this. Don't you think a stereo cassette player that you can listen to while walking around is a good idea?" All the device needed now was a name. Originally the Walkman was introduced in the U.S. as the "Sound-About" and in the UK as the "Stowaway," but coming up with new, uncopyrighted names in every country it was marketed in proved costly; Sony eventually decided on "Walkman" as a play on the Sony Pressman, a mono cassette recorder the first Walkman prototype was based on. First released in Japan, it was a massive hit: while Sony predicted it would only sell about 5,000 units a month, the Walkman sold upwards of 50,000 in the first two months. Sony wasn't the first company to introduce portable audio: the first-ever portable transistor radio, the index card-sized Regency TR-1, debuted in 1954. But the Walkman's unprecedented combination of portability (it ran on two AA batteries) and privacy (it featured a headphone jack but no external speaker) made it the ideal product for thousands of consumers looking for a compact portable stereo that they could take with them anywhere. The TPS-L2 was introduced in the U.S. in June 1980. The 1980s could well have been the Walkman decade. The popularity of Sony's device  and those by brands like Aiwa, Panasonic and Toshiba who followed in Sony's lead  helped the cassette tape outsell vinyl records for the first time in 1983. By 1986 the word "Walkman" had entered the Oxford English Dictionary. Its launch coincided with the birth of the aerobics craze, and millions used the Walkman to make their workouts more entertaining. Between 1987 and 1997  the height of the Walkman's popularity  the number of people who said they walked for exercise increased by 30%. Sony continued to roll out variations on its theme, adding such innovations as AM/FM receivers, bass boost and auto-reverse on later models. 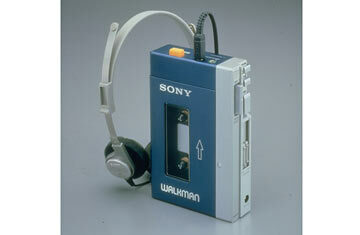 Sony even made a solar-powered Walkman, water-resistant Sport Walkmans and even devices with two cassette drives. But cassettes, like any technology, weren't going to last forever. With the introduction of compact discs in 1982 the format began to go the way of the 8-track itself. Sony, however, was fairly quick to jump to new formats: it introduced the D-50 portable CD player a year after the first compact discs were sold, and later rolled out MiniDisc and MP3 players under the Walkman brand. (Its insistence for several years on sticking to a proprietary digital music format, ATRAC, left it far behind Apple's iPod in terms of market share.) Since its launch, Sony has released more than 300 different models across all formats; it currently makes Walkman-branded MP3 players, phones and even portable DVD players. Its newest device, the Walkman NWZ-X1000, features a 3-inch OLED screen, 32 gigabytes of memory and WiFi connectivity. But the company still makes play-only cassette Walkmen, too  its latest model to be released in the U.S. was the WM-FX290 in 2002.